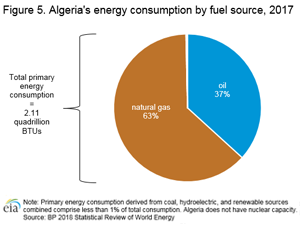 Algeria relies heavily on revenue generated from the hydrocarbon sector, comprising approximately one-third of total government revenue in 2016, according to the latest estimates from the International Monetary Fund (IMF). The Algerian government’s dependence on crude oil for economic growth increases its vulnerability to crude oil price volatility. The government’s 2016–2019 economic plan reduces its exposure to crude oil price volatility by diversifying its exports (hydrocarbons accounted for more than 90% of total exports in 2016) and by reducing its domestic energy consumption growth (of which hydrocarbons is the primary fuel source) to 3% in 2030. Algeria held an estimated 12.2 billion barrels (b) of proved crude oil reserves at the beginning of 2018. All of the country's proved oil reserves are held onshore because offshore exploration has been limited. 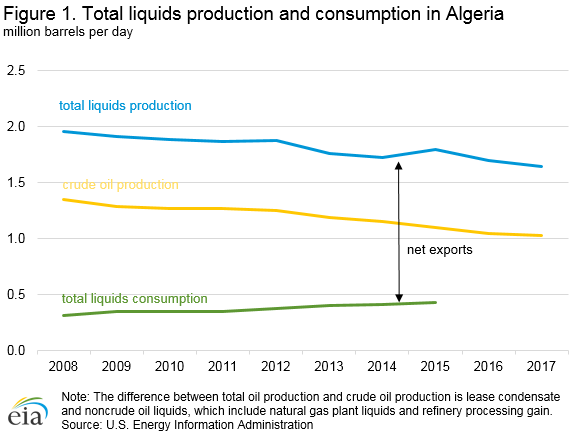 Algeria produced an estimated average of 1.0 million b/d of crude oil in 2017 (Figure 1). Combined with approximately 280,000 b/d of lease condensate and 335,000 b/d of non-crude oil liquids, which are not included in its quota for the Organization of the Petroleum Exporting Countries (OPEC), Algeria's petroleum and other liquids production averaged more than 1.6 million b/d in 2017. As part of the OPEC production cut agreement in 2016, Algeria has agreed to limit its production to 1.04 million b/d and has been able to comply with this obligation. The announcement at the OPEC meeting in Vienna in June 2018 to allow countries that were overcompliant to increase production levels will not affect Algeria because it does not have any spare capacity. Algeria has six active refineries as of January 2018 with a total capacity of approximately 618,000 barrels per day (b/d), according to BMI Research. 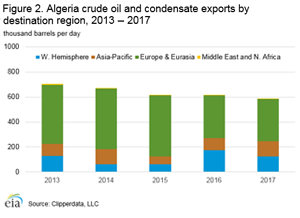 In 2017, Algeria exported approximately 580,000 b/d of crude oil and condensate, according to EIA estimates based on vessel tracking data provided by Clipperdata. The biggest export destination by volume in 2017 was Europe and Eurasia, which received 57% of Algeria’s total exports, followed by both the Western Hemisphere and Asia-Pacific regions, which received 21% of Algeria’s exports each. France and the United Kingdom were the largest export destination countries by volume, importing 92,000 b/d and 82,000 b/d, respectively. The United States was one of Algeria's largest markets for crude oil for almost a decade until 2013. 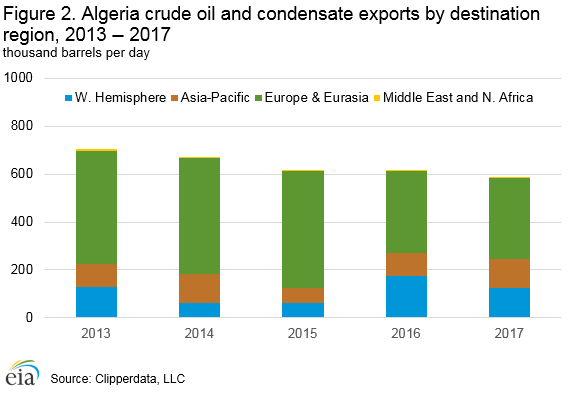 U.S. crude oil imports from Algeria have substantially declined in recent years. The United States imported approximately 66,000 b/d of crude oil from Algeria in 2017, which is down from a peak of 443,000 b/d in 2007. 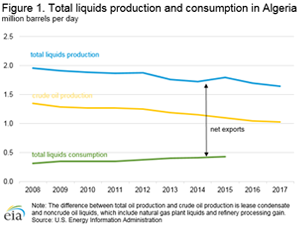 The growth in U.S. light, sweet crude oil production from the Bakken and Eagle Ford shale plays has resulted in a sizable decline in U.S. imports of crude oil grades of similar quality, such as Algeria's crude oil. According to the Oil & Gas Journal, as of January 2018, Algeria had 159 trillion cubic feet (Tcf) of proved natural gas reserves. 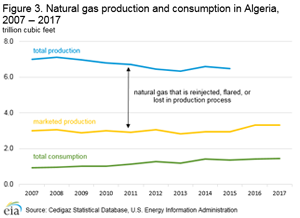 Algeria’s gross natural gas production was 6.5 Tcf in 2015, according to estimates provided by Cedigaz. A substantial amount of natural gas is either reinjected into wells to enhance oil recovery or is vented and/or flared. The remainder is either used for domestic consumption or exported to other countries. The In Amenas natural gas plant restarted operations in July 2016 after security procedures were overhauled; production was shut in after an attack by militants in 2013. The restart of production should lead to an increase in natural gas production in the upcoming year, barring any unplanned disruptions. Algeria is in the process of completing the first phase of its Southwest Gas Project. The first phase includes Reggane Nord and Timimoun, which started production in December 2017 and February 2018, respectively, and Touat, which is scheduled to come online in late 2018 (Table 1). Although the startup of the Reganne Nord and Timimoun fields will provide a boost to natural gas production, it will not be sufficient to offset the declines from mature fields. 1 Billion cubic feet per year is Bcf/y. 2 Field expansion at In Salah is to ensure that the current level of output at In Salah is maintained. 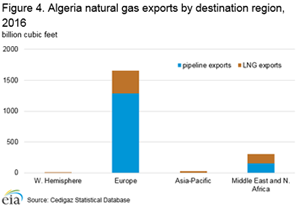 Algeria exported approximately 2.0 Tcf of natural gas in 2016, of which approximately 1.4 Tcf was transported via pipelines and 550 Bcf by LNG tankers. In 2016, about 83% of Algeria's natural gas exports were sent to Europe and about 15% was sent to the Middle East and North Africa (Figure 4). Regarding European exports, Italy and Spain were by far the largest export destinations, taking 667 Bcf and 526 Bcf of natural gas, respectively. According to BMI Research, this increase is attributed to cheaper pricing of Sonatrach’s contracts, which are indexed to crude oil and are a reflection of the lower oil price environment. 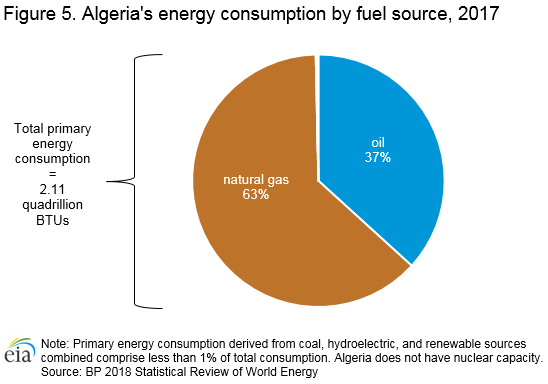 According to the latest estimates provided by the BP 2018 Statistical Review of World Energy, Algeria’s domestic energy consumption was approximately 2.11 quadrillion British thermal units in 2017. Algeria primarily uses petroleum or petroleum products and natural gas to meet domestic demand. Only a small fraction of domestic consumption derives from coal, hydroelectric, and renewables. Algeria does not have any nuclear capacity, nor does it have any substantial hydroelectric, coal-fired, or renewable capacity. Algeria's electricity generation capacity reached approximately 19 gigawatts (GW) in 2016. Electricity consumption was approximately 56 billion kilowatthours (kWh) in Algeria in 2016, double its amount a decade ago. Most generation capacity comes from natural gas-fired and combined-cycle power plants. The share of renewable energy in Algeria's generation mix is growing but still limited. According to the latest estimates by the World Bank Group, 99% of Algeria’s population had access to electricity, with approximately 100% in urban areas and 98% in rural areas. Although extensive and serving almost the entire population, Algeria’s transmission and distribution systems have had relatively high losses at 15.9% in 2016. Sonelgaz aims to increase total generating capacity to 21.4 GW by 2018, mostly in the form of natural gas-fired or combined-cycle natural gas turbine (CCGT) power plants. However, the lack of funding has resulted in project delays, and when these facilities will be brought online is unclear. Algeria does not have any significant hydroelectric power generation capacity. According to the latest estimates by the World Energy Council, Algeria had 228 megawatts (MW) of hydroelectric power generation capacity as of 2016. Algeria added 262 MW of solar capacity in 2015, which is part of a 400 MW solar capacity program that started in 2013. Also, Sonelgaz commissioned a 12 turbine, 10 MW wind farm at Adrar in 2014, which is a pilot project for a wind capacity program that plans to bring 639 MW of wind capacity online by 2023. In response to stakeholder feedback, the U.S. Energy Information Administration has revised the format of the Country Analysis Briefs. As of January 2019, updated briefs are available in two complementary formats: the Country Analysis Executive Summary provides an overview of recent developments in a country's energy sector and the Background Reference provides historical context. Archived versions will remain available in the original format. Data presented in the text are the most recent available as of March 25, 2019.
International Monetary Fund, 2018 Article IV Consultation (2018). International Monetary Fund, 2018 Article IV Consultation (2018). "Algeria Charts New Economic Direction. Is It Battling Against the Tide?" Middle East Economic Survey, Vol. 60, Issue 18, May 5, 2017. "Worldwide Look at Reserves and Production," Oil & Gas Journal, Worldwide Report [Table], December 4, 2017, pg. 21. 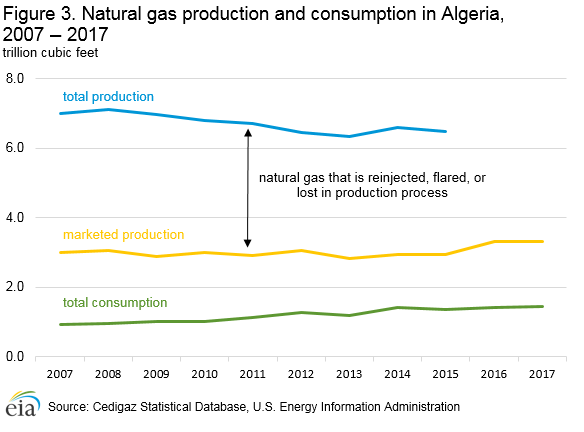 "Algeria Oil & Gas Report, Q1 2018," BMI Research, November 2017, pg. 67. Data taken from Clipperdata vessel tracking service, accessed 8/16/2018. U.S. Energy Information Administration, International Energy Statistics database, accessed 11/5/2018. Cedigaz Statistical Database, accessed 8/17/2018; U.S. Energy Information Administration, International Energy Statistics database, accessed 11/5/2018. "Algeria Oil & Gas Report Q1 2018," BMI Research, November 2017, pg. 22. Middle East Economic Survey, "Algeria’s Upstream Investment: Running To Stand Still" (May 29, 2015), volume 52, issue 22. Cedigaz Statistical Database, accessed 8/17/2018. "Algeria Oil & Gas Report Q1 2018," BMI Research Service, November 2017, pg. 36. 2018 BP Statistical Review of World Energy, accessed 8/20/2018. U.S. Energy Information Administration, International Energy Statistics. World Bank Group, World Bank Open Data Portal, accessed 8/23/2018. "Algeria Power Report, 2017," BMI Research Service, April 2017, pg. 23. "Algeria Eyes 2.4G Power Capacity Boost By Mid-2018, But Money is Tight," Middle East Economic Survey, Vol. 60, Issue 47, November 24, 2017. "Hydropower in Algeria," World Energy Council, accessed 10/9/2018. Middle East Economic Survey, "Can Algeria Live Up To Its Renewable Potential?" (April 3, 2015), volume 58, issue 14.